Did you know that it's absolutely possible to make a delicious gluten-free pizza? Yes! It'll wow your family and friends! Because who could give up on pizza, even if faced with dietary restrictions? Although my family is not gluten-free, I like to lessen our susceptibility to food allergies by varying and rotating grains. And guess what? 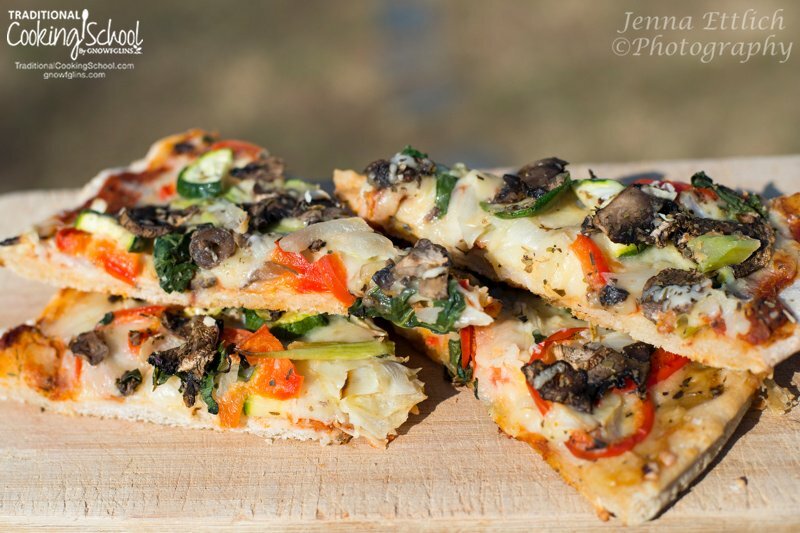 My family likes this gluten-free pizza even better than its spelt counterpart! 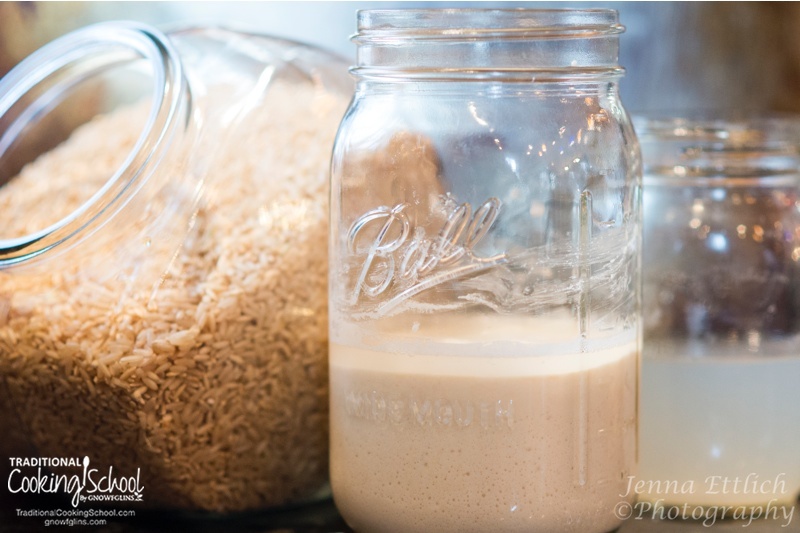 It's time to make a gluten-free sourdough starter — specifically, a boosted brown rice starter. I followed this recipe from the Art of Gluten-free Sourdough Baking website by Sharon Kane. Follow those directions to make the starter, then proceed with the pizza crust recipe. Don't want to make your own starter? You can purchase gluten-free sourdough starter here or here. 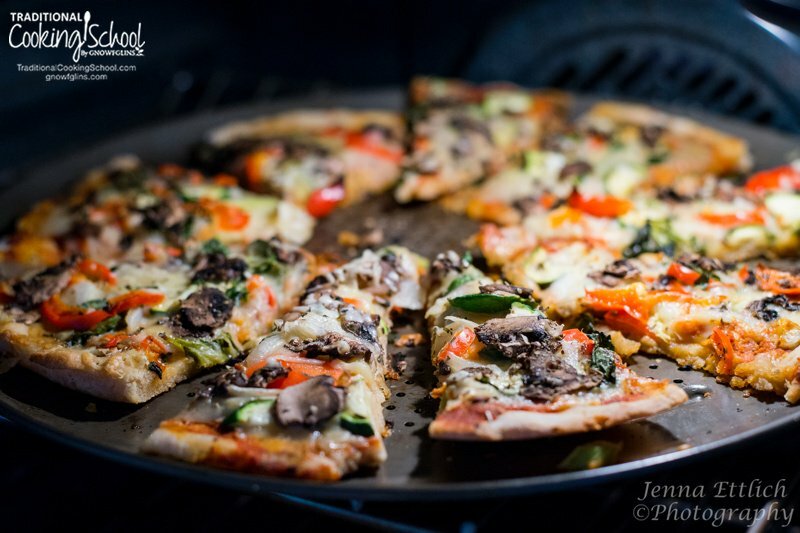 Did you know that it's absolutely possible to make a delicious gluten-free pizza? Yes! It'll wow your family and friends! Recipe easily doubled. In a medium sized-bowl, stir together sourdough starter and water. Then add sea salt and olive oil. Then add flours slowly until dough is easy to knead. If too dry, add a little more water. If dough seems sticky, add a bit more flour. But don't add too much as gluten-free dough will crumble as a result. Knead dough on the counter or in a mixer for 1 to 2 minutes. Look for a soft dough that stays together, not a sticky, batter-like dough. Grease a bowl, set dough ball in bowl, cover, and let sour for 8 to 24 hours. After souring, preheat oven to 450 degrees Fahrenheit. 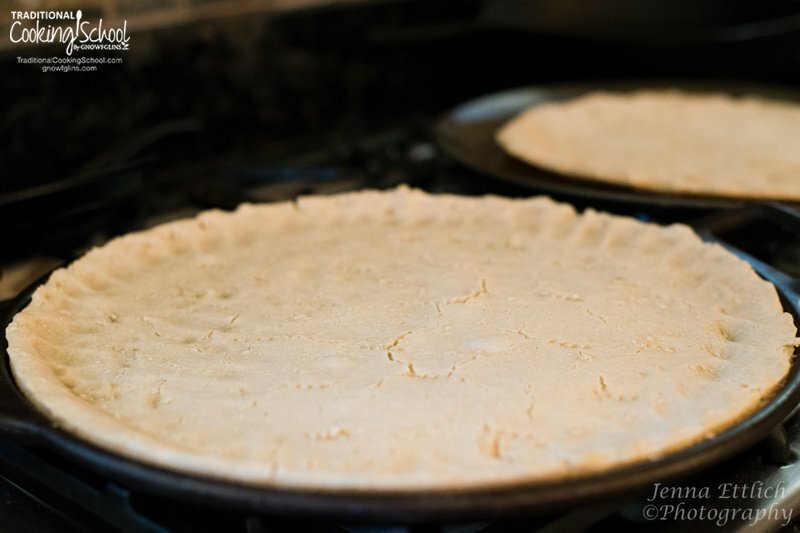 Then spread dough onto a parchment-paper lined cookie sheet or straight onto a greased pizza pan. Press it out with your hands instead of using a rolling pin. Bake in the preheated oven for about 10 minutes, until slightly browned. Then bake pizza for 15 to 25 minutes in 450 degree Fahrenheit oven. To serve, allow to cool for a few minutes before slicing. To reheat leftovers, place in 325 degree Fahrenheit oven for about 20 minutes. This makes an incredibly easy lunch the next day! For longer storage, freeze either whole or in slices. 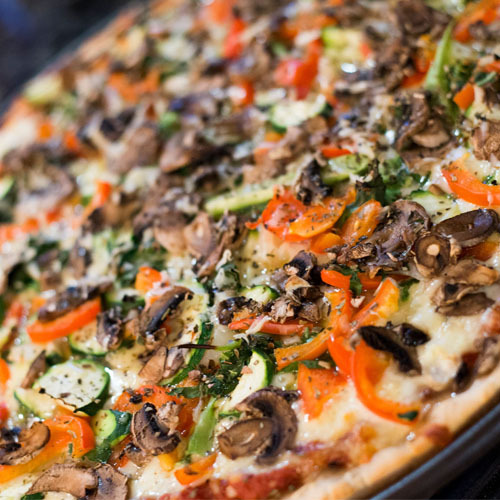 *For toppings, we love mozzarella and parmesan cheeses, hidden under a bed of fresh vegetables. We also enjoy Hawaiian pizza — complete with fresh pineapple and ham. Be creative and flexible. *Last time I made this pizza, I didn’t have quite enough homemade sauce left, but I did have a half-cup of pureed butternut squash sitting in the refrigerator. (You can see where this is going.) That tomato-sauce-mixed-with-pureed-butternut-squash was so tasty, mild, and unnoticeable to the kids! *Finally, someday I plan to make topped pizzas as well as sourdough crusts to store in the freezer. They will be a very easy “go to” on busy nights, or when we have no idea what to make for lunch. Perhaps sometime we'll even have unexpected visitors that we can “wow” with pizza! Do you make your own pizza crusts? Have you considered sourdough? What are your favorite toppings? Want more gluten-free sourdough? Check out our Sourdough eCourse or Sourdough eBook or our Allergy-Free Cooking eCourse. I am a pizza hound! So, a couple of months ago, I set out to make a gf crust using brown rice flour sourdough starter and it was awesome! The hubby didn’t even realize it was gf until I asked him if he could tell, he said “no”. He took leftovers to work and gave a piece to a coworker who raved about it and told him was gf…his response, “what is gluten”…haha…guys are funny. I’ll have to give yours a try too, looks yummy! Friday night is pizza night at our house. We’ve enjoyed using spelt but we might have to give this a try. We’re not doing gluten free either, but I think we’d enjoy this. Is the dough such that it can be baked on a pizza stone without falling apart? Hi Jenny, We have long enjoyed the spelt sourdough recipe too. But now we are glad to have added this GF sourdough recipe to our list of pizza options! I have not used a pizza stone, but I do know that after our pizza has been thoroughly cooked, I can easily slip a spatula under the pizza (after a few minutes of cooling) and lightly push the whole pizza (without it breaking) onto a cutting board. Hope this helps, and do tell us how it works out for your Friday pizza night! I use a pizza stone with the crusts I’ve done in the past, but because they can be more fragile (not sure about this one) I roll them out on parchment, trim it close to the crust and bake it on the pizza stone that way… comes out great! I don’t roll, I press with my fingers . . . straight onto the pans. I grease my pans with a thin layer of coconut oil. I’m wondering in your “Sourdough Starter” recipe if something can be substituted for the water kefir?? I do milk kefir and sometimes have some whey?? Yay! Thank you so much for this recipe! I’ve been recently diagnosed with a wheat allergy and I miss the sourdough crust that the rest of my family eats. I use a very similar recipe. I love it, sometimes I make tortillas out of it. I put them on parchment, then put them on griddle pan. They stay soft and pliable, when first side is cooked I lift off parchment and flip them. Yummy! Also, then make a delicious thin crust pizza. What would be the steps for making this dough ahead of time and freezing it? Roll out and do initial bake, or leave in a ball? I’d love to have extra on hand for quick dinners. Could I substitute the sweet brown rice flour for sweet sorghum flour? 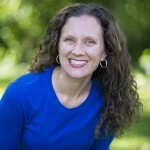 Nadine, look on the site (or others) for a grain swap table. It will help you with density and such from GF grain to grain. My question is Does this only make a thin crust pizza? Or can I get a thicker crust out of it? I hate thin crust pizza and all GF I can buy are crackers and disappointing. I found one GF recipe online that works most of the time. (Temperamental ingredients, I guess.) wondered about converting it to a sourdough recipe. what’s the difference between sweet brown rice flour and just brown rice flour? I only have see brown rice flour. Could I just use that and not the other? So sad that it uses brown rice flour! I stopped eating most rice, particularly rice flour, after discovering that organic does not mean that it’s tested for heavy metals. Any rice from China is notoriously high in lead and since I usually don’t know the source, esp for the rice flours, it’s easier just to cut it out. It’s ok; I have other gluten free pizza crust recipes that I will try. Thanks anyway!